I am working on a custom Drupal 8 module that has its own authentication form. What I am not able to figure out is how can I replace Drupal's default Register and Login links which are scattered everywhere on the website to point to above route. I don't want to redirect from /user/login page to /custom-signup as I still want to allow admin to login. For all other users except admins should be redirected to \custom-signup. I could use jquery to brute-force my way to replace the links, but is there an efficient way to achieve this? TL;DR: I need to replace following default Drupal links using my module. Following the first solution, I added the routing files as follows, the links are redirecting me to my custom form. However, when I try to enter user/login manually in the URL, I get page not found message on the website. // Change path '/user/login' to '/customn-login'. // Change path '/user/register' to '/custom-signup'. For more in depth information, see Altering existing routes and adding new routes based on dynamic ones. If you still want /user/login to work, then you can create a new route for it. Remember to clear all caches to see changes. 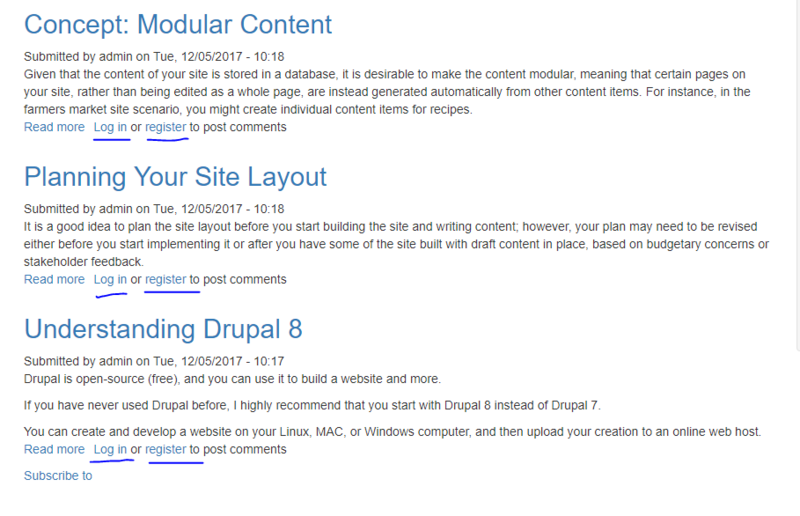 How do I remove unused drupal links? how to create a link to mysite/user and how to theme mysite/user?